Man it's been awhile since this site has been updated. May/June has been super busy for me...every weekend traveling. 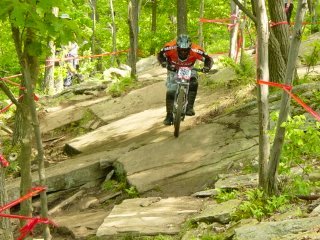 The end of May was the US Open at Diablo Freeride Park-Moutain Creek Ski Resort, NJ. Vernon, NJ is the better looking park of NJ; the top of the trash can one would say. 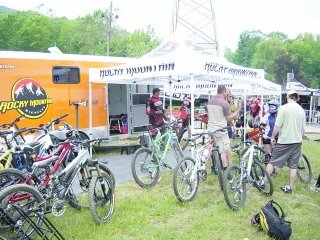 I was with Rocky Mountain Bikes as tech support; setting up demo bikes and repairing some. The Switch was getting a lot trail time as well as the RMXs. Demo area. Bikes where stocked, riders rocked. The cat in the brown and tan shirt is my RMB rep.
A view out towards the base of the mountain. 8ft drop off the deck to 15ft high pile of dirt. Squat and drop. Eric Charles taking the best line of the first rock garden. To the left would set you up for a front wheel grabbing rock to front dismount. 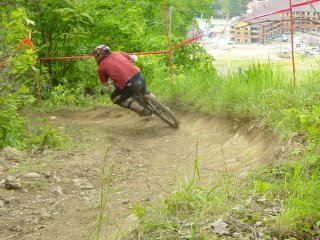 Railing the last left hander before coming out onto the ski slope. The day was packed with riders...500 to be exact. From 39 states and 4 countries. There were about 20 women competing too. This event has definitly proven itself to be one of the nations biggest events for 2 wheels.